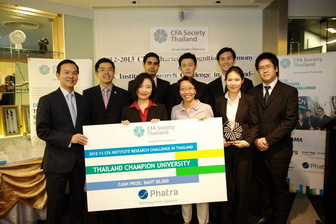 On 12 January 2013, from a long period of hard-working; we, as the representative of Thammasat University, won the CFA Research Challenge in Thailand for another year. For local round, the competition started on September 23, 2012 with a kick-off meeting. There were 6 teams from 6 universities to participate in this competition but only 4 teams could proceed to the final round. At the meeting, we were give IVL as a subject company to do the analysis. After the announcement of finalist, we focused on doing presentation slides and practicing in both presentation and Q&A. 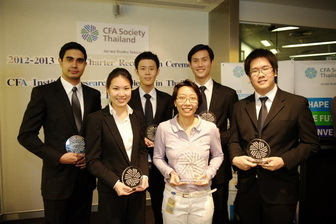 On 12 January 2013, we went to the Stock Exchange of Thailand to compete in the final round of CFA Research Challenge Competition 2013. Apart from us, there were 3 other teams which are Chulalongkorn University, Assumption University and Webster University. Through tough presentation and Q&A among all of 4 universities, Thammasat University, for the 4th year in a row, won the national round. As the national winner, we proceed to Regional Round which is held at Kuala Lumper, Malaysia. There are 19 universities from all over Asia to compete with us at next round. The national champion is an accomplishment to us, and Thammasat University, however it is also only the beginning another challenge. Lastly, we would like to express our gratitude to Ajarn Pantisa and Ajarn Anchada. We definitely could not have reached this far without supports from both of them who helped coaching us in terms of analysis as well as presentation skills. We also would like to say thank you to BBA Thammasat faculty members for the support. Posted date: January 21, 2013 � 09:50 Hrs.